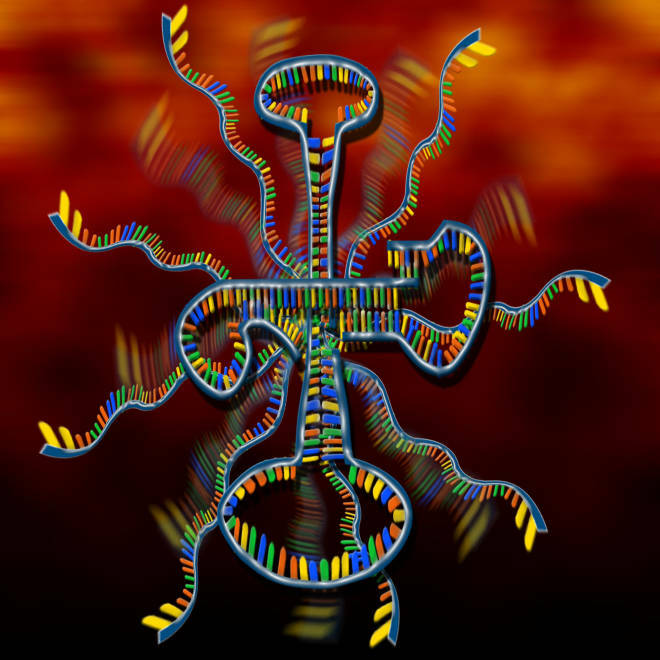 An artist's conception shows an RNA molecule, which may have served as an early form of life on Earth. The debate over the definition of life is getting messier and messier, but one of the pioneers on the biochemical frontier is suggesting a method to tell whether scientists are actually looking at a new form of life: Follow the bits of information that are contained in the chemistry. "How many heritable 'bits' of information are involved, and where did they come from?" Scripps Research Institute biologist Gerald Joyce asks in an essay published today by the journal PLoS Biology. "A genetic system that contains more bits than the number that were required to initiate its operation might reasonably be considered a new form of life." By that definition, we're not yet close to identifying alien life, in the lab or in the cosmos, Joyce told me today. "The fact is, there is only one known form of life, and we're part of it. Someday, maybe there'll be something that's off the grid, but everything we know is part of the tree of life." Joyce says that verdict applies to microbes with artificially constructed DNA, such as the bacteria that were built in a lab two years ago, as well as to the arsenic-tolerant bacteria that were at one time touted as a form of alien life. He worries that all these claims about creating or finding alien life could backfire. "We've had enough of these false alarms that I'm getting a little nervous that the public is going to perceive it as 'crying wolf,'" he said. "There have been enough examples that we need to just cool it a little." Joyce applies the same rule of thumb to his own research, which focuses on RNA enzymes that can be combined to create a synthetic genome. In the essay, he notes that the RNA enzymes can "evolve" into new forms, but contain only 24 bits of their own heritable information in the form of chemical base pairs. The molecules need another 60 bits of information that are provided at the outset and are not subject to mutation and selection. "Thus, of the 84 total bits required for the system to replicate and evolve, only about one-fourth can be counted as part of the system's molecular memory," he writes. "The synthetic genetic system is not a new life form because it operates mostly on borrowed bits." Is it even possible to come up with a life form from scratch? That's one of the key reasons for having a working definition, so that scientists know alien life when they see it ... or make it. The synthetic bacteria created by J. Craig Venter and his colleagues wouldn't qualify because those microbes are merely using a computerized genetic code that was tweaked from nature. "Craig Venter knows that he didn't make a new life form. He remade Mycoplasma," Joyce said. But if RNA enzymes — or another class of synthetic molecules known as xenonucleic acid polymers or XNA — could be developed into stand-alone genetic systems, with more than half of the information passed along through an alternate chemistry, that just might lead to a truly new form of life. "That's definitely knocking on the door ... What you'd need is an XNA molecule that has the function of copying XNA parent molecules to produce XNA progeny with pretty good fidelity," Joyce said. Right now, the XNA bits have to be swapped into DNA for amplification, he noted. Joyce said alien life could be created in the lab, or its fingerprints could be detected far from our solar system. "About a decade from now, we're going to start seeing the atmospheric composition of extrasolar planets," he said. If future telescopes pick up the signs of unusual chemistry — say, an unexpected excess of ozone — that could point to potential life processes. But to clinch the case, scientists would need to learn enough about the mechanism behind the chemistry, and how that chemistry preserves "molecular memory" from one generation to the next. "To me, in a slogan, biology is chemistry plus history," Joyce said. "There's a special class of chemistry that has memory, that has history built in. It's a kind of chemistry that learns from experience." Confirming the existence of biological-style chemistry on Mars, or in some other environment in our own solar system, presents a special case. "Now we're really in the game," Joyce said. "We're talking about 'spit-carrying molecules.' Maybe we can get little snippets of information and start stitching that together, and have enough to say, 'OK, is it on the tree of life or not?' If the sequence is just off the tree, was it a deep branch, or did it become its own thing?" Joyce said the alien-life debate could well be reignited by developments right here on Earth, such as the analysis of samples brought up from Lake Vostok, a freshwater lake hidden beneath a miles-thick layer of Antarctic ice. "I won't be surprised, when the samples come up from James Cameron's deep dive to the Mariana Trench, that someone starts thinking that there's something weird down there," he said in a PLoS Biology podcast. "Maybe it's an alternative life form." One thing's for sure: Until another truly alien form of life is created or discovered, it's impossible to make a meaningful estimate of how common life might be in the universe, or arrive at the answer to one of life's ultimate questions: Are we alone? "I think humans are lonely, and long for another form of life in the universe, preferably one that is intelligent and benevolent," Joyce said in a PLoS news release. "But wishing upon a star does not make it so. We must either discover alternative life or construct it in the laboratory. Someday it may be discovered by a Columbus who travels to a distant world or, more likely in my opinion, invented by a Geppetto who toils at the workbench." Can scientists define 'life' ... using just three words? What should society do about synthetic life? In the PLoS Biology podcast, Joyce discusses the search for new life forms and synthetic biology. Joyce's work was supported by NASA and the National Science Foundation. The funders had no role in study design, data collection and analysis, decision to publish, or preparation of the manuscript.